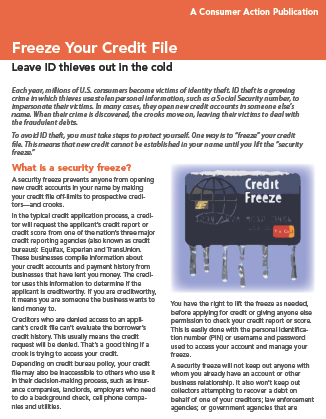 A credit file "security freeze" is a preventive tool to help you avoid identity theft and to block impostors from using your personal information to establish credit. This publication explains how to "freeze" your credit file, which prevents new credit from being established in your name until you temporarily or permanently lift the freeze. This publication is part of the Credit Freeze training module. What is a security freeze? Who should consider a security freeze? Each year, millions of U.S. consumers become victims of identity theft. ID theft is a growing crime in which thieves use stolen personal information, such as a Social Security number, to impersonate their victims. In many cases, they open new credit accounts in someone else’s name. When their crime is discovered, the crooks move on, leaving their victims to deal with the fraudulent debts. A security freeze prevents anyone from opening new credit accounts in your name by making your credit file off-limits to prospective creditors—and crooks. In the typical credit application process, a creditor will request the applicant’s credit report or credit score from one of the nation’s three major credit reporting agencies (also known as credit bureaus): Equifax, Experian and TransUnion. These businesses compile information about your credit accounts and payment history from businesses that have lent you money. The creditor uses this information to determine if the applicant is creditworthy. If you are creditworthy, it means you are someone the business wants to lend money to. Creditors who are denied access to an applicant’s credit file can’t evaluate the borrower’s credit history. This usually means the credit request will be denied. That’s a good thing if a crook is trying to access your credit. Depending on credit bureau policy, your credit file may also be inaccessible to others who use it in their decision-making process, such as insurance companies, landlords, employers who need to do a background check, cell phone companies and utilities. You have the right to lift the freeze as needed, before applying for credit or giving anyone else permission to check your credit report or score. This is easily done with the personal identification number (PIN) or username and password used to access your account and manage your freeze. A security freeze will not keep out anyone with whom you already have an account or other business relationship. It also won’t keep out collectors attempting to recover a debt on behalf of one of your creditors; law enforcement agencies; or government agencies that are collecting child support payments, taxes or investigating public benefits fraud. Your information also may still be used for the purpose of prescreening for pre-approved offers of credit or insurance, even if a security freeze is on the report. Consider both the benefits and drawbacks of freezing your credit file before you decide whether or not to place a security freeze. Placing a security freeze—and lifting it—is free. Freezing provides much greater protection than a monthly credit monitoring service, and there is no cost. A security freeze is only effective if you activate it at all three credit reporting agencies. If you’re married, that means six freezes for full protection. Whenever you want someone who is locked out to have access to your credit report or score, you must temporarily lift the freeze (or remove it permanently). Even though lifting the freeze shouldn’t take more than an hour, that could still be too slow if you’re trying to get “instant credit” from a merchant at the time of your purchase. Anyone can place a security freeze, but consumers whose Social Security number has been revealed unintentionally—through a company “security breach” or a lost wallet, for example—should seriously consider it as a precaution. So should anyone who has had their mail stolen or otherwise had their personal or account information revealed. If you are a victim of ID theft—even if the case is old and/or resolved—consider a security freeze to prevent new cases of identity theft perpetrated by crooks who have bought your stolen information. If you want an added measure of protection but think that the cons of a security freeze outweigh the pros, or if you are actively seeking new credit or doing other things (like applying to rent a home) that could require access to your credit file, consider a “fraud alert.” This notation on your credit report notifies prospective creditors that you may be at a higher risk for identity theft and that they should take extra precautions to verify the credit applicant’s identity before opening a new account. The new law that went into effect on Sept. 21, 2018, extends “initial” fraud alerts from 90 days to one year. An extended fraud alert, available to identity theft victims, lasts for seven years. An “active duty military alert” lasts for one year. Request an alert with any one of the three major credit bureaus; that company will notify the other two bureaus. Freeze procedures vary among the three credit reporting agencies. Contact each bureau to get specific instructions for placing a security freeze. Within five days of your request, the credit bureau must send you a confirmation of the freeze and instructions for lifting it. Depending on how you requested the freeze, you may be assigned (or choose) a PIN, which you will use whenever you temporarily lift the freeze and if you permanently remove it. Or, if you signed up online, you might instead use your username and password to manage your freeze. Get a free credit report from each credit reporting agency once every 12 months. Opt out of receiving certain types of marketing mail, including pre-approved credit offers that an ID thief could intercept. IdentityTheft.gov is the Federal Trade Commission’s website for reporting identity theft, getting a recovery plan and learning more about protecting yourself. The Consumer Financial Protection Bureau (CFPB) accepts consumer complaints related to financial products and services. If you have trouble placing, lifting or removing a freeze, try to resolve the issue directly with the credit bureau(s) first. If you are unsuccessful, you can report the problem to the CFPB. Consumer Action offers a companion publication, the Security Freeze Backgrounder, which answers common questions about placing, lifting and removing a security freeze. Download the Q&A from the Consumer Action website.